As many of you may know, Slasher Studios was honored to be in attendance at the Chicago Fear Fest last month in support of our slasher short “Teddy.” During the two day film festival we saw nearly a dozen shorts and a couple of features. Sadly, we were unable to see everything that we wanted to see. It is the curse of film festivals. There are always at least two movies playing at any given time and it is impossible to catch everything. As we went to the after-party on the second night, we began to hear buzz about a killer short psychological thriller titled “Familiar.” It was the talk of the room and we had at least a dozen people come up to us and ask whether or not we had seen this mind-bending little chiller. We sadly had not. It was no surprise to anyone to hear the film win for Best Short at the film festival. With a thank you to producer Zach Green, Slasher Studios has been given an exclusive screener in order to view the film. Does it live up to the hype and massive expectations of the Chicago Fear Fest or is it a case of hype overwhelming substance? Let’s crack open this thriller and see what we have in store. 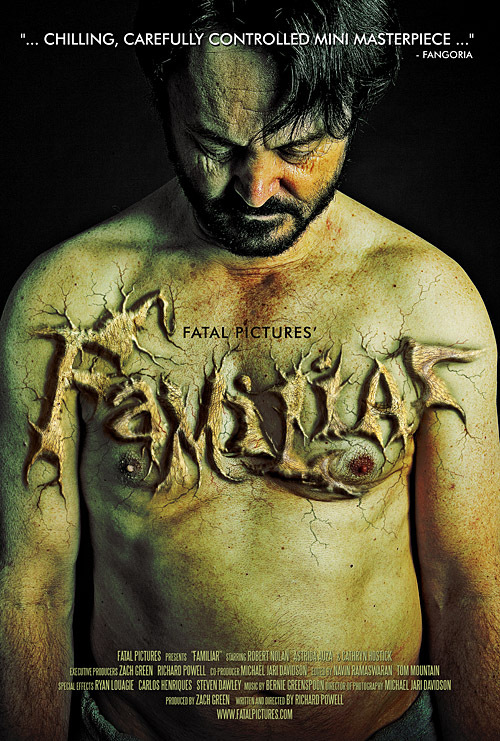 The third short film from Fatal Pictures, “Familiar” tells the story of John Dodd, a 45-year old workaholic trapped in his very own mundane existence. In a chillingly intense performance by Robert Nolan, Dodd is a quiet, down-to-earth man who can and will snap at even given moment if given the chance. A man looking for a change in his life. Something different, something new, something fresh…anything really. He wants to be able to live again. With his daughter going off to college soon and a wife that is trapped in her own little world, he feels as if he is finally given the opportunity to escape from his very own hell. He doesn’t need to listen to his family, he knows what they are going to say before they even do. If he thinks that he will be given a chance to breakaway he is dead wrong, his wife is pregnant and his hell will continue for at least another 18 years. One manic turn of events boil to a conclusion that is as unsettling as it is horrifying. “Familiar” is the kind of storytelling that is simply not made in Hollywood today. Filmmaking that is powerful in its intensity and raw to its emotional core. Director Richard Powell handles the story with care and doesn’t tend to over do the monotony of Dodd’s life and turn it into melodrama. In a short film consisting of about 80% voiceover, we are literally living the story through Dodd’s mind and seeing what he is seeing through his dark eyes of despair. I simply cannot say enough about Nolan’s performance. This is the kind of role that any actor would dream of and he relishes every juicy moment in a script full of twists and turns and some unsettling and stomach churning effects. The score is positively eerie in a way that builds real tension instead of delivering simply cheap and unwanted scares. “Familiar” won’t be for everyone but for those in the mood for a psychological thriller with a lot of punch, this delivers more in 24 minutes than most features do in 90.